Seeking harmony and peace is something I do regularly. This blend from Young Living Essential Oils promotes physical and emotional healing through the aromas. The blend of sandalwood, lavender, ylang ylang, frankincense, orange, angelica, geranium, hyssop, spanish sage, spruce, coriander, bergamot, lemon, jasmine, roman chamomile, palmarosa, and rose oil calms the nerves and keeps anxiety at bay. Obviously, there are a ton of different oils listed there, but each one has its own cause. Sandalwood simulates the pineal gland and helps remove negativity. Lavender relaxes and calms the body and helps combat insomnia and headaches. Ylang Ylang promtes relaxation and restores equilibrium. Frankincense elevates the mind and helps to overcome stress and despair. Orange induces a calming effect over the whole body. Angelica brings memories back and helps to release negative feelings. Geranium stimulates nerves and balances hormones. Spanish Sage is high in limonene, which prevents DNA damage. Spruce opens and releases emotional blocks. Coriander relieves nausea and supports healthy immune function. Bergamot uplifts and calms, relieving stress, anxiety, and tension. Lemon is stimulating and invigorating which helps with well-being. Roman Chamomile purges toxins from the liver. Palmarosa is revitalizing to the nervous and cardiovascular systems. Rose creates a sense of balance, harmony, and well-being and also elevates the mind. 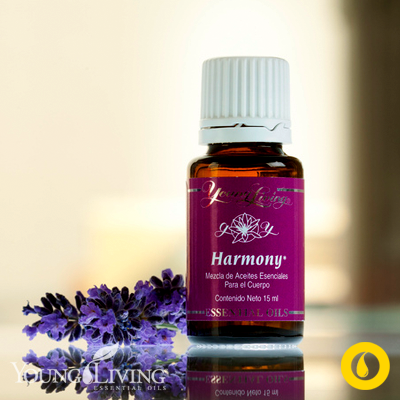 With that combination, Harmony essential oil blend is a sure-fire way to increase that balance and harmony within your own life.